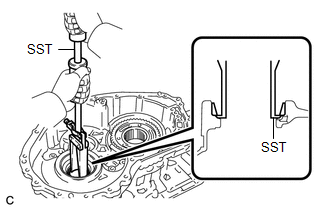 (a) Using SST, remove the front transaxle case oil seal from the transaxle housing. 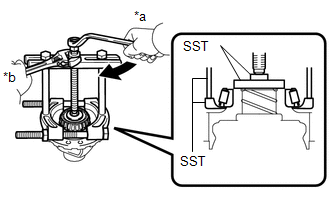 (a) Using SST, remove the transaxle case oil seal from the transaxle case sub-assembly. 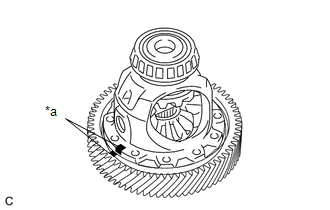 (a) Put matchmarks on the front differential ring gear and front differential case. 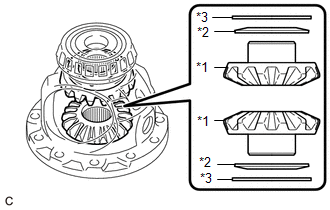 (b) Remove the 12 bolts from the front differential ring gear. 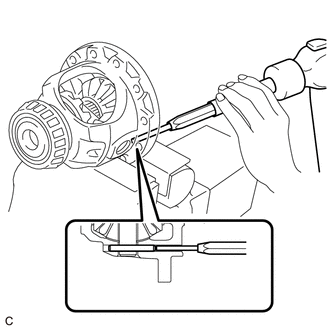 (c) Using a plastic hammer, tap on the front differential ring gear to remove it from the front differential case. (a) Secure the front differential case in a vise between aluminum plates. (b) Using a 5 mm pin punch and a hammer, remove the front differential pinion shaft straight pin from the front differential case. (a) Remove the front No. 1 differential pinion shaft from the front differential case. 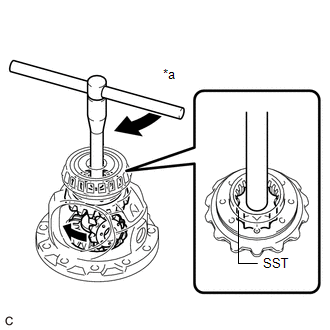 (a) Install SST as shown in the illustration and tighten it. 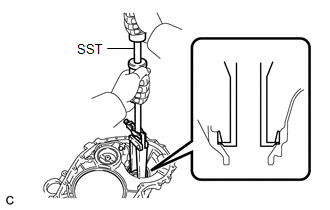 Do not overtighten SST, as doing so will damage the front differential side gears, conical springs, front No. 1 differential side gear thrust washers and front differential case. 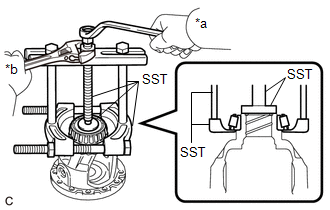 Tighten SST until there is clearance between the front differential pinions and front differential side gears. When removing the front differential pinions, do not overtighten SST, as it is necessary to rotate the front differential side gears. 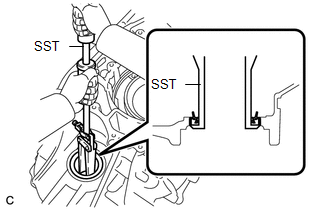 (b) Install SST as shown in the illustration, rotate the front differential side gear, and then remove the 2 front differential pinions and 2 front differential pinion thrust washers from the front differential case. 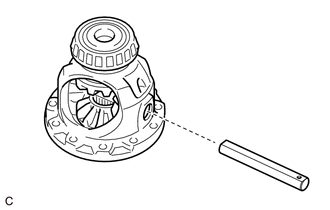 Do not drop the front differential pinion and front differential pinion thrust washer. 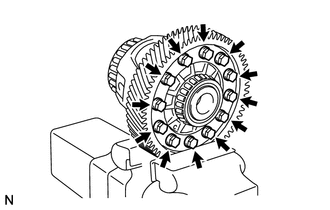 (c) Remove SST from the front differential case, and then remove the 2 front differential side gears, 2 front No. 1 differential side gear thrust washers and 2 conical springs from the front differential case. Do not drop the front differential side gear, front No. 1 differential side gear thrust washer or conical spring. 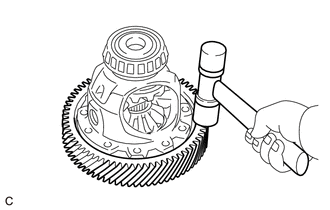 (a) Using SST, remove the front differential case front tapered roller bearing (inner race) from the front differential case. (b) Using SST, remove the front differential case front tapered roller bearing (outer race) and shim from the transaxle housing. 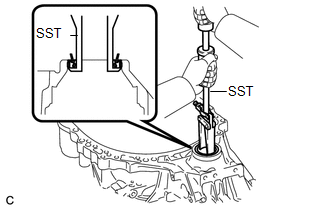 (a) Using SST, remove the front differential case rear tapered roller bearing (inner race) from the front differential case. (b) Using SST, remove the front differential case rear tapered roller bearing (outer race) from the transaxle case sub-assembly.